If you’ve visited William Chris a few times and participated in a wine tasting, chances are you may have tasted a Mourvèdre. And if you’re a wine club member, you’ve probably received some Mourvèdre in a past shipment. You may have noticed we quite like Mourvèdres around here. So, why do we love the Mourvèdre grape so much? Let’s talk about Mourvèdre for a second and what makes it so special. 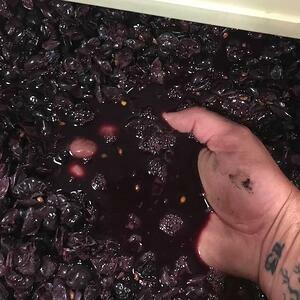 Winemaker Josh Fritsche shows off the color of our 2017 Lost Draw Mourvèdre during fermentation. First, how the heck do you pronounce it? Until you’ve heard someone else say it a few times, it can be an intimidating varietal to talk about. I’ve broken down the pronunciation like this -- “More” (like, “I’ll have one MORE glass, please.”) - ”Ved” (rhymes with dead) - “Druh” (like “duh” but with a “r”). More-Ved-Druh...Mourvèdre. Why did William Chris become so excited about the Mourvèdre grape? History credits the Phoenicians for introducing the grape to Valencia around 500 B.C. The grape made its way to France (the Rhône Valley) and partnered up with Grenache and Syrah to become part of the holy trinity that makes up the GSM blend. Interestingly, Mourvèdre is rarely found as a single varietal in Europe, but William Chris has managed to elevate this grape to another level and has great success using the grape on its own as well as in red blends. As the Mourvèdre vines age and the roots penetrate into deeper layers of the soil, the fruit becomes rich and multi-layered, grabbing hold of the terroir in a much shorter time than with other varietals. Because of its amenability to growing conditions in Texas, it also displays a richness and complexity not found in the fruit in Europe and can hold its own as a single varietal as well as a blending grape. “Very few people make a single varietal of Mourvèdre; it was a sweet afterthought for us and provides us with a little bit of an edge in the national marketplace,” says Chris. As you can see from the descriptions above, Mourvèdre is proving to be a very versatile grape. We have capitalized on the advantages of growing the grape in Texas and remain excited about its creative potential and the opportunity to continue to bring you exceptional wine from this Old World varietal.